Medical practice is based on two fundamental steps, the diagnosis and the treatment of the disease. Even though it is presented as a simple task here, the great diversity of presentations and unknown etiology of the disease can make this task difficult. A great example of this is the clinical evaluation of leukemia. Leukemia are a type of hematologic malignancy with numerous subtypes. Because of these subtypes a proper evaluation of the signs and symptoms of leukemia becomes essential in the management of this group of disorders. Leukemia, like all diseases, must initially be studied by its clinical manifestations. In other to comprehend this it is essential to recall the various type of leukemia and the underlying mechanism which cause the signs and symptoms of leukemia. Because of this it can be useful to divide the clinical manifestations into two groups, the general signs and symptoms of leukemia and the specific of each subtype. Leukemia is a group of hematologic malignancy which originates from the hematopoietic system. It is a varied group with great diversity in their causes and cytological variations. However, the general signs and symptoms of leukemia tend to be similar due to the common processes which occur in all leukemias. An essential characteristic of leukemia is the abnormal and unregulated proliferation of hematopoietic stem cells. The hematopoietic system is a group of cells which in response to normal physiological signals, divide in a regulated manner. However, when this process becomes unregulated the first group of signs and symptoms of leukemia manifest, clinical manifestations resulting from decreased production of regular blood cells. Which essentially are grouped into signs resulting from anemia, thrombocytopenia and leukopenia. The other group includes manifestations resulting from the invasion of malignant cells. The second group of sign and symptoms of leukemia are divided into intramedullary and extramedullary syndromes. The first group of manifestations results from the dysfunction of the hematopoietic system. As previously stated, the hematopoietic system function is to produce all of the hematologic cells. However, because its energy is diverted into creating malignant cells, the regular hematologic cells become deficient. This cancer might produce a lot of cells but these cells will belong to only one group of cells or produce immature dysfunctional cells. When all blood cells are decreased, described as pancytopenia, three groups of signs and symptoms of leukemia can appear. One of the main groups of clinical manifestations are cause by anemia, or the decrease in red blood cells. Also the decrease in platelets, or thrombocytopenia results in numerous signs and symptoms result from the dysfunction in the regular coagulative process. Finally, low white blood cells, or leukopenia will manifest as frequent infections. Another cause of the signs and symptoms of leukemia are the accumulation of malignant cells initially restricted to areas associated to hematopoiesis but later can expand to parts with bone marrow. These clinical manifestations are described as intramedullary signs. The increase in the production of cells can cause the infiltration of blast cells (immature blood cells) results in an increased volume in a patient´s bone marrow. Later, when medullary levels become too high, the pressure builds up and manifest as pain. Pain can present either as tenderness in bones or extreme pain. The last group of signs and symptoms of leukemia are the extramedullary signs. These result from the effect of malignant cells outside the bone marrow. This a greatly varied group and are usually grouped according to the organ system which is affected. Normally they are the result of the invasion of cells into tissues, but can also result from the increased destruction of malignant cells. However, these clinical manifestations vary greatly according to the type of leukemia. Therefore, it is easier to consider them when discussing the specific signs of each type of leukemia. Like many other cancers, leukemia is a group of hematologic cancers with a great number of subtypes. Two things are used to classify the type of leukemia, the type of stem cell from which malignant cells derive from and the progression of the type of leukemia. Considering these two aspects, 4 types of leukemia are identified, acute myeloblastic leukemia, acute lymphoblastic leukemia, chronic myeloblastic leukemia and chronic lymphoblastic leukemia. However, because of the similarities with another group hematologic cancers called lymphomas, chronic lymphoblastic leukemias are not considered true leukemias. Because this disease is not currently classified as leukemia it will not be considered when discussing the specific signs and symptoms of leukemia. When studying the specific signs and symptoms of leukemia it is important to observe first of all the temporal aspect of clinical manifestations. Because of this the name of each subtype is useful because it provides an essential insight into the presentation of each subtype. Additionally, the frequency of the general signs and symptoms of leukemia, can vary between each subtype. Finally, it is fundamental distinguish which specific clinical manifestations of leukemia are specific to each subtype. Acute myelogenous leukemia is one of the main groups within leukemia. It is not a single type of illness, rather it is a group of hematologic cancers which results in the production and increase in the concentration of immature hematopoietic cells. As previously stated, the production of malignant cells uses nutrients which the production of regular mature red blood cells or plateletsneeds. The subtypes within this group can only be identified through the microscopic study of cells regarding their morphology, cytochemistry and immunophenotyping. Therefore, the clinical presentation of all subtypes will resemble. Like the other groups of leukemia, they have general and extramedullary clinical manifestations. The initial signs and symptoms resemble a general viral-like illness presenting with fatigue, malaise and depending on the presence of infection or not, low-grade fever. Additionally, the patient presents bone pain either as tenderness or localized bone and joint pain. Finally, anorexia is another sign in acute myelogenous leukemia. However, due to the relative brevity of this illness (hence the name acute), no weight loss is reported from patients. Among the general signs, manifestations arise from a deficiency of the three cell lines, red blood cells, platelets and white blood cells. The deficiency of red blood cells produces diverse anemic signs and symptoms such as pallor, weakness and other cardiovascular signs. Thrombocytopenia results in a deficiency in the coagulatory system, causing petechiae, ecchymosis, oozing from gums, epistaxis and excessive bleeding after dental procedures. 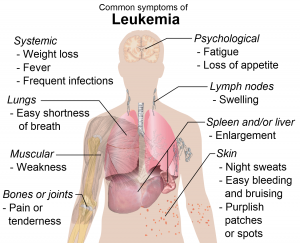 Other, signs and symptoms of leukemia in this group result from the invasion of other organs and tissues, which include skin tissue, the eye, the gastrointestinal system, and cardiorespiratory affections. As cancerous cells move into skin tissue numerous manifestations may occur, such as leukemia cutis. Leukemia cutis, occurs in 10% of patient and presents as violaceous plaques or nodules. Another affection of the skin is Sweet’s syndrome, characterized by tender red plaques found in the extremities. The last type of skin affections are chloromas local collection of blasts which form subcutaneous tumors. Another site of chloromas involve the patient’s eyes. Patients with acute myelogenic leukemia can also present ophthalmic lesions, which can occur in the optic nerve, the choroid and the retina. Like in the skin, chloromas can form in the eye causing visual problems in some patients. Symptoms such as blurred vision (which can progress to full blindness). Upon funduscopic examination, papilledema and disk pallor. Gastrointestinal signs and symptoms are frequent in acute myeloblastic leukemia. Additional to dysphagia, they main clinical manifestations are the result of infections such oral candidiasis and perianal infection. Other systems affected by infections include the cardiopulmonary system. Additional abnormalities result from metabolic and electrolyte alteration, which affect regular heart function. One of the main causes within acute myelogenic leukemia is tumor lysis syndrome. Tumor lysis syndrome can cause a diverse group of complication resulting from severe metabolic alterations. As lots of cells break apart, their contents are released into the blood stream and metabolic imbalance are generated. The four alteration of solute changes in the blood are hyperuricemia, hyperkalemia, hyperphosphatemia and hypocalcemia. Obviously these cannot be measured by study of signs and symptoms, but each of these alteration can produce clinical presentations associated with the syndrome. For example, hyperuricemia produces urate nephropathy, which can manifest with a decrease in urine production. Hyperphosphatemia causes further renal damage and lowers calcium blood levels. As a result, hypocalcemia can produce muscle cramps, cardiac arrhythmias, and abnormal sequential muscle contractions. Additionally, hyperkalemia produces palpitations due to alteration in heart rhythm as well. Another acute type of leukemia is acute lymphoblastic leukemia, in which instead of myelogenic stem cells, lymphoblastic cells create the cancerous cells. Like, acute myelogenous leukemia, the clinical manifestations of this disease appear in a rapid manner. However, not all general signs and symptoms of leukemia will manifest in this group of diseases. Patients present general malaise, weakness and extreme bone pain. The clinical manifestations of pancytopenia appear in varying degrees of intensity. The extramedullary spread will allow the distinction between other types of leukemia. The most frequent sites of extramedullary spread are the liver, spleen and lymphatic nodes. As a consequence, most patients will present lymphadenopathy and two-thirds of patients will present hepatosplenomegaly. The increase in the size of these organs is associated with the prognosis of the patient, larger increase suggests poor prognosis in patients. However, in most cases these will be asymptomatic and will only be detected through the physical exam. Additional sites of extramedullary spread include the central nervous system, the testicles and the kidneys. The spread to the kidneys principally manifest as a renal cortical enlarge, aside from this in general, no other clinical manifestations occur. However, the signs and symptoms of acute lymphoblastic leukemia associated with malignant cells spreading to spread into the testes and the central nervous system are much more clinically significant. The clinical manifestations from the spread to the nervous system can result from the introductionof cells from the circulatory system or from the bone marrow in the skull. Initially, the meninges will be affected and afterward will continue to dominate the signs and symptoms associated with theaffection of the nervous system. The main cause of the clinical presentations results from cranial hypertension. Manifestations include, headaches, nuchal rigidity, nausea and vomiting, papilledema, irritability and lethargy. Testicular involvement is a site to which malignant cells commonly spread to. Testicular affection will be initially asymptomatic but later can present clinical manifestation, mainly unilateral enlargement of the testes. The clinical relevance of this manifestation, is that it is associated with bone marrow remission. The last group of leukemia are the chronic myeloblastic leukemias. In contrast to the previous groups, chronic myeloblastic leukemias are do not present rapidly. Most symptoms appear over the course of months. During the initial stage or the chronic stage, general signs and symptoms of leukemia are present, such as fatigue and anorexia (which in this case is associated with weight loss). Additionally, the presences of the malignant cells produce a hypermetabolic state which produces fevers and night sweats. Other signs of the chronic stage include anemic signs, purpura, and hepatosplenomegaly. The enlargement of the spleen in chronic myeloblastic leukemia additionally can cause left upper quadrant pain and fast satiety (due to the compression of the stomach by the enlarged spleen). Sometimes neurological symptoms can also appear as epileptic symptoms or confusion. Other rare signs include the development of priapism or a painful erection. Chronic myeloblastic leukemia also has an acute phase. Even though it is not common, the presence of indicates the progression into the acute phase. This phase is characterized by an increase in the intensity of the general signs and symptoms of leukemia. The clinical presentation of the acute phase closely resembles the clinical presentation of acute leukemia. When performing a diagnosis, a physician needs to be aware of the different possible causes of the clinical findings in patients. This is particularly relevant in leukemia where distinct subtype of leukemia need to be identified. However, it is also important to consider other similar disease such as the non-malignant non-proliferative disease and the other hematologic cancers, such as lymphomas. Even though the definitive distinction between these group of illnesses will be the result of laboratories studies, a physician evaluation of signs and symptoms of leukemia, can provide hints that will allow the identification of a type of leukemia.